Humans are a major reason why the earth can change. Deforestation is a one way that humans change the earth. For this week’s homework look at the picture below. Previous Previous post: History – Why did people explore? 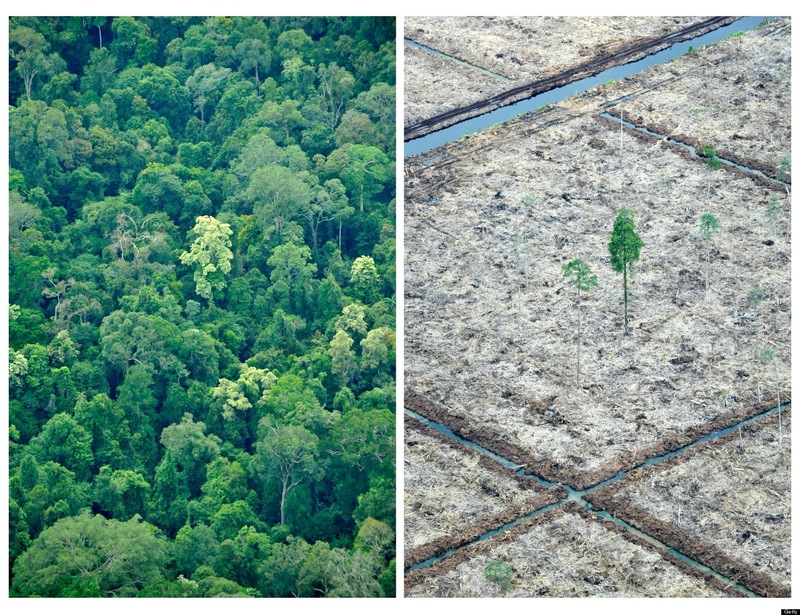 Deforestation is a process that makes forests get demolished/destroyed/broken. Image No.1: Forest is okay and not harmed or demolished. Image No.2: Forest is destroyed and has being harmed by the natures landscape. Deforestion is when people cut all of the trees. The land is destroyed by trucks. Deforestation is when people cut down the trees. The land is destroyed by people and fires. Deforestation is when humans cut down trees which are destroying animal habitats. It can also cause death to animals because some animals that live in rain forests live in trees so when they cut them down they can lose their homes. Also they get some of their food from the leaves that are on the trees. 1. Trees are healthy and they look very fresh. Looks like there is more then 100 trees. Looks like a normal rain forest. Beautiful scenery. 2. Super different from picture number one. It looks like as if there were 300 trees to now only 5-10. Completely demolished. Dry dirt. Very thin trees. Ugly and disgusting scenery. A Deforestation is when the humans cut down all the trees and destroy all of the animals habits. The difference between the two pictures is the first picture is when all the trees were there and the second picture is when the humans came and destroyed the trees. Deforestation is a forest where animals live and people destroy the forest by chopping down the trees so animals can’t live. The difference in the picture was in the first picture there is trees and the second picture there is none because they have all been chopped down. When trees are cut down. 1st picture: the trees are lively and fresh. Deforestation is when people cut down trees. and destroy animal habitat. some animals die when there habitat gets destroyed and they have nowhere to live. Deforestation is where people cut trees down. There were lots of trees and in the after picture there was no trees left. Deforestation is when people cut down a lot of trees and can kill wild life, because some animals get their food from the leaves and some live in the trees. The forest has heaps of trees, life, energy and looks bright, beautiful, colourful, shiny, rich and fresh. It also looks like it has hundreds of trees. The forest isn’t really a forest any more because people cut down all of the trees and probably killed heaps of wild life.